we use copper sheet/ silver sheet/ allumunium sheet to emboss any design or photo. After embossing, we apply silver & gold polish ( ganga jamuni polish) on the photo. We can do the meena work optionally and finally, using fiber bit we frame the photo in the format you order - double framing, single framing, box framing. We are presenting an excellent quality assortment of Fiber Photo Frame. 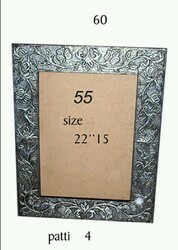 Our offered ranges of Fiber Photo Frame are extremely praised by patrons for their sturdy nature and superior finish. These products are made by skillful professionals using the superior input and other material. Our offered products are extremely used by patrons for their reliable characteristics and strong nature. This Fiber Photo Frame is made of quality material that is not prone to wear and tear. Counted as first among the best, we provide the handpicked quality of Fiber Photo Frame. Their alluring appearance and impeccable finish make these products highly demanded.